Ground floor: Entrance hall, toilet for guest, large bright living room with access to garden, bedroom with en suite bathroom and direct access to the sunny terrace. Dining area with access to the side terrace and fully equipped kitchen with upscale appliances and access to the rear terrace. Separate laundry room and cellar. Elevator. Upstairs: 2 bedrooms en suite (one with access to a large terrace with panoramic views). Spacious dressing room with possibility to convert into bedroom # 4. Toilet and fitness area with access to the pool area. Elevator. Large basement for 2 vehicles. Elevator. Exterior: Several sitting areas, terraces and wonderful infinity pool with panoramic views, summer kitchen, Jacuzzi and sauna. 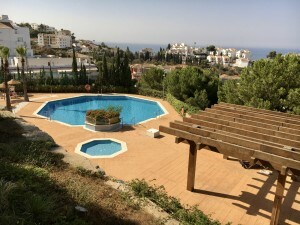 Top quality Villa with many special features. Plot 727m2. Built size 273m2. Year Built 1970 (recently fully renovated).